This is National Child Passenger Safety Week, when parents can get answers to common questions about driving safely with their children. National Child Passenger Safety Week began last weekend and is observed by the National Highway Traffic Safety Administration (NHTSA) and local communities. It ends this weekend with National Seat Check Saturday. Motor vehicle accidents are one of the leading causes of death for children in the United States. Child safety seats reduce the risk for injury if they are used properly, by more than 70 percent when it comes to infants and more than 50 percent for children age 1 to 4. But parents have long struggled with how to use them. In one study, more than 70 percent of 3,500 observed car and booster seats were misused in a way that could harm children, according to the Centers for Disease Control and Prevention (CDC). Parents should also closely examine their child safety seat models this year. Several months ago, Graco recalled more than 6 million child safety seats, the largest car seat recall in U.S. history. Parents reported they were unable to unbuckle defective harnesses and had to cut their children out of the straps. The cause was food was getting dried up in the harnesses and causing them to stick. 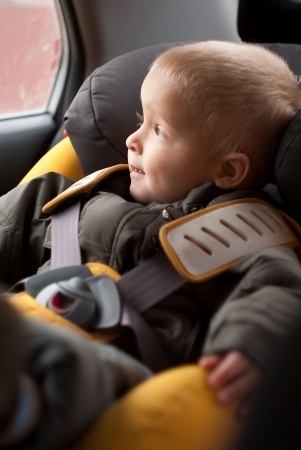 Child passenger safety laws have changed over the past decade and every state now has a law for infants and children-fitting specific criteria. All but two (Florida and South Dakota) require booster seats for older children. The Massachusetts Child Passenger Safety Law requires children to ride in federally-approved child passenger safety seats that are properly secured until they are eight years old or over 57 inches tall. Despite laws for older children, Safe Kids, a national non-profit organization, has released a new report, showing 7 in 10 parents did not know a child should be at least 57 inches or 4’9″ tall before they ride in a car without a booster seat. The organization surveyed 1,000 adults. Check Your Car Seat Label. Become informed about the specifics of car seats. Make sure yours fits your child’s weight, size and age. For infants through age two, look for a rear-facing child safety seat. For children between ages 2 -4 or up to 40 pounds, choose a forward facing child safety seat. From age 4 to 8 or 57 inches, children should ride in belt positioning booster seats. Read more. Car Safety Seat Checklist for Parents. Safe Kids has developed this checklist for parents. Register Your Car Seat. Here is a resource from the NHTSA on registering your car seats with the manufacturer. This will allow the manufacturer to contact you if there is a defect. Used Car Seat Safety Checklist. Here is a resource from the NHTSA on using used child safety seats. Community Events. Some organizations offer free car seat safety inspections this weekend as part of National Seat Check Saturday and allow parents to make appointments with trained professionals throughout the year. Here is a directory of locations or you can contact your local police department to ask about resources in your community. The Boston car accident lawyers at Breakstone, White & Gluck have over 100 years of experience representing clients who have been injured by the negligence of others on the roads. For a free legal consultation, contact us at 800-379-1244 or 617-723-7676 or use our contact form.